Recently, one married elderly couple displayed themselves as the epitome of “Till death do us part.” Posted online by their granddaughter, this harrowing photo displays the depths of one man’s love for his wife as he says goodbye for the last time after 77-years of marriage. A caption attached to the photo, posted by the granddaughter of the elderly couple, reads, “My grandma, 96, with my grandpa, 100, hours before her death this weekend. 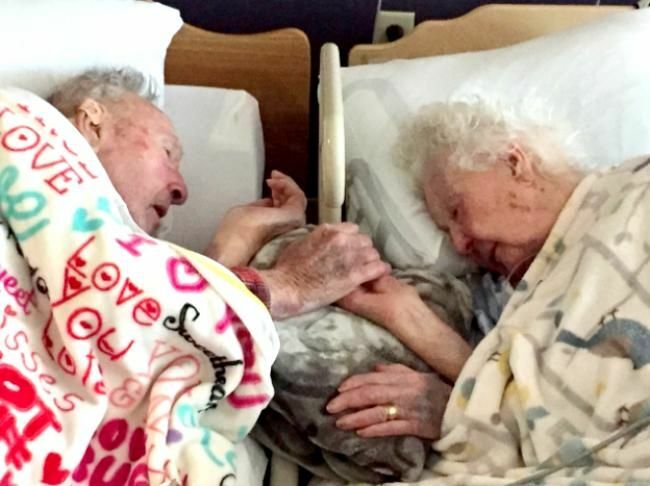 77 years of marriage.” The photo has gone viral, softening the hearts of couples around the world. One commenter states, “Sorry for your loss and what a ‘great’ way to go. Holding hands with your spouse, in a warm bed, presumably with loved ones around. Sympathy to your grandfather who lost his lifelong wife. God bless, all around.” Oddly, the granddaughter claimed to have received a number of hateful responses to the photo. It strains the mind to think of a reason why anyone might be angered by this couple’s beautiful display of love and commitment. The granddaughter responded to one of the many positive comments, saying, “Thank you. This note made much of the ‘hate’ I’ve received worth it.” What is your reaction to the photo?